Another opportunity to have some fun came when I found a piece of maple that wasn't the typical "half cylinder" from which I'd make a normal bowl (above left). In the lower sketch at the left, you can see what I was faced with. 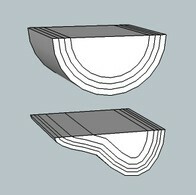 I could make a small bowl from the thicker right-hand section, but that would mean wasting nearly half the diameter of the log. Alternatively, I could make a large shallow platter -- but that would be a waste of the thicker material. Instead, I decided to make the best of what I had -- a bowl with a wide rim, much wider on one side than the other ... it's done by mounting the blank on two different axes: first the central axis, to form the shape of the outside rim and flatten the face, then remounting the blank on a second axis (at the thickest part of the blank) and shaping the bowl. At first, I had just the bowl, which looked rather like an inverted baseball cap, and was about as stable. 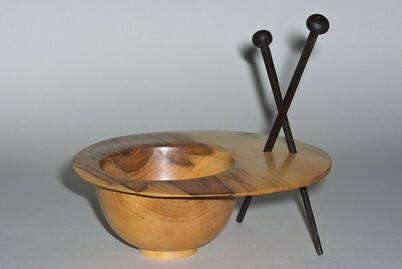 A friend at the woodturning club suggested adding a leg to support the wide rim, and the image of a bowl of Chinese food and a pair of chopsticks popped into my mind. I chose Wenge, the darkest wood I had in stock at the time, for the sticks. This made life a little more difficult -- it is not an easy wood to work with, being very splintery. Add to this the fact that long thin sticks are a bit tricky to deal with at the best of times, since they flex and chatter against the cutting edge of the tool, and it made it a real challenge. I had to stop frequently to resharpen the edge of my skew chisel, and take the lightest of cuts as I thinned the sticks. It was worth the effort, though -- the contrast of the very dark Wenge sticks against the creamy Maple is exactly what I was hoping to achieve, and I really like the quirky result. 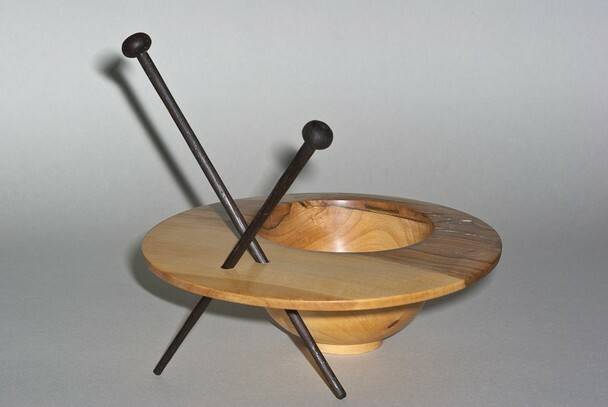 Above and left: an eccentric bowl made of Maple, with Wenge sticks.